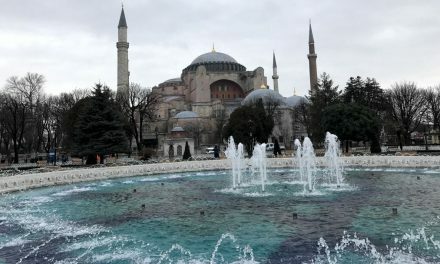 We mean, really, you would think after traversing Iran, to visit the tomb of Cyrus the Great; gazing at the golden horn in Istanbul, or imagining the roar, as you stare at the Colosseum, you would be a little jaded when viewing new places. Not so! 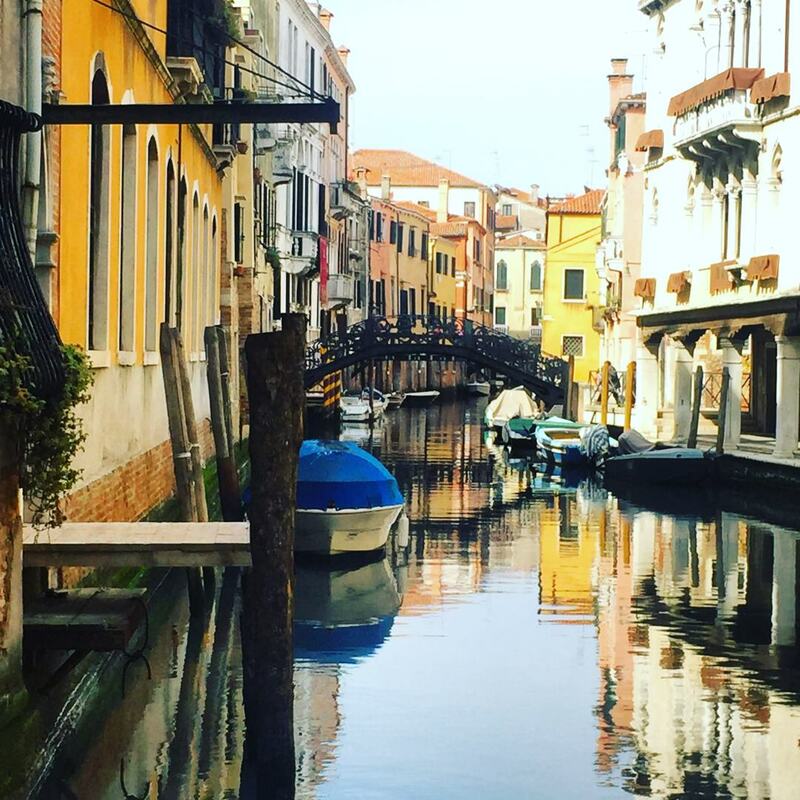 Venice added a completely new dimension to our travel experience. There is a mesmerising quality to the city. The gondolas surfing the waves amid brightly coloured tethering poles, the sunlight glinting off a thousand coursing rivulets, the sea spray adding a soft viscous glow to the whole picture, whilst the crowds throng this way and that. And the the air of decay and acceptance from the buildings that have served silent witness to the passing centuries. Sorry to go a bit Venizzia Sciocco, but Venice mesmerised us and captured our hearts. We arrived late Thursday afternoon, on the train from Lucignano via Arezzo. We got lost three minutes after taking directions to our AirBnb apartment. Second time around we got there and were delighted to find a homely, spacious, first floor apartment, with a lovely aspect over the street below. 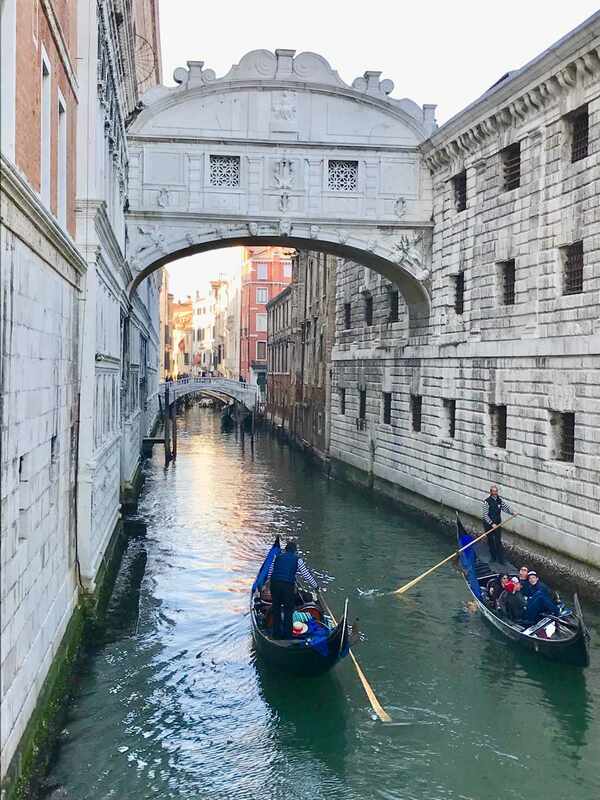 Within minutes of leaving the apartment we were joyously lost again, there was nothing for it but to dump the map and follow our noses and the odd sign, to the most famous of attractions in Venice, the Rialto and San Marco Piazza. Through myriad alleyways, across wonderful little stepped stone bridges, around corners surprising us with unexpected options, we got lost; but found decadent, mysterious, intriguing Venice. 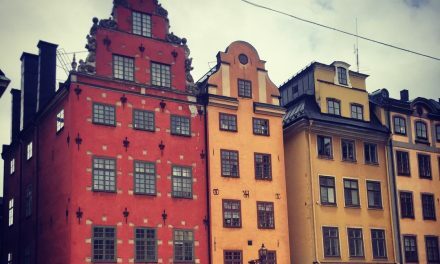 It took us quite a time to peruse the cafes, pretty little shops, bars and an incredible array of masque galleries that recalled the carnivales, balls and galas that formed the mad, luxurious events of the past 500 years. We finally arrived in St Mark’s Square where, like Spinal Tap, everything was ratcheted up to eleven. The scene in St Mark’s is quite literally, breathtaking. We both felt quite emotional at the scale and sheer beauty of the whole area and then were again taken aback as we strolled toward Grand Canal; serenaded by the duelling quartets set up in the square and the ever present gasp and sigh of tourists entering for the first time. There are few words to convey the wonder of Venice, just go and be joyously lost too. 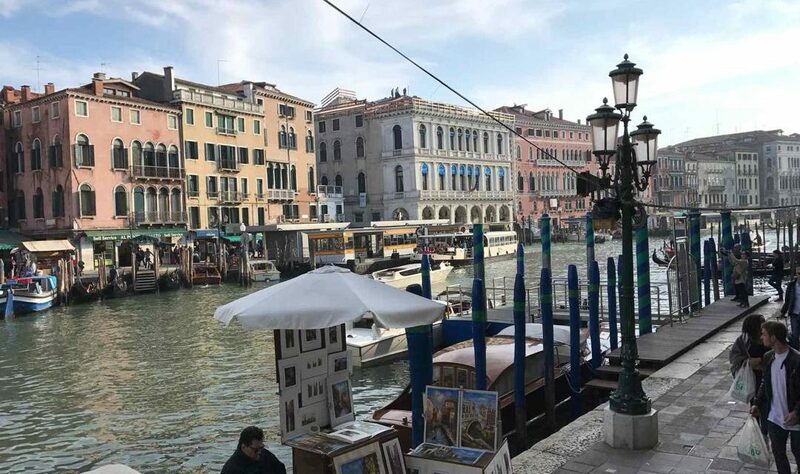 As we then strolled around the square and finally out toward the Grand Canal, the vista opened up and combined once again to create an amazing view: the Venetian Lagoon, the island backdrop, the gondolas, riding skittishly up and down on the waves, straining at their pylons. The gondoliers in their gaily striped outfits straining against the sea as they steered their charges into shore; the crowds of tourists becoming a part of the picture: here a bride decked out in red organza posing for the photographer, there a mini skirted, blue dreadlocked photographer taking photos of her no less gaudily dressed subjects and of course the constant wave of sightseers clamouring for space to grab their piece of the prize. 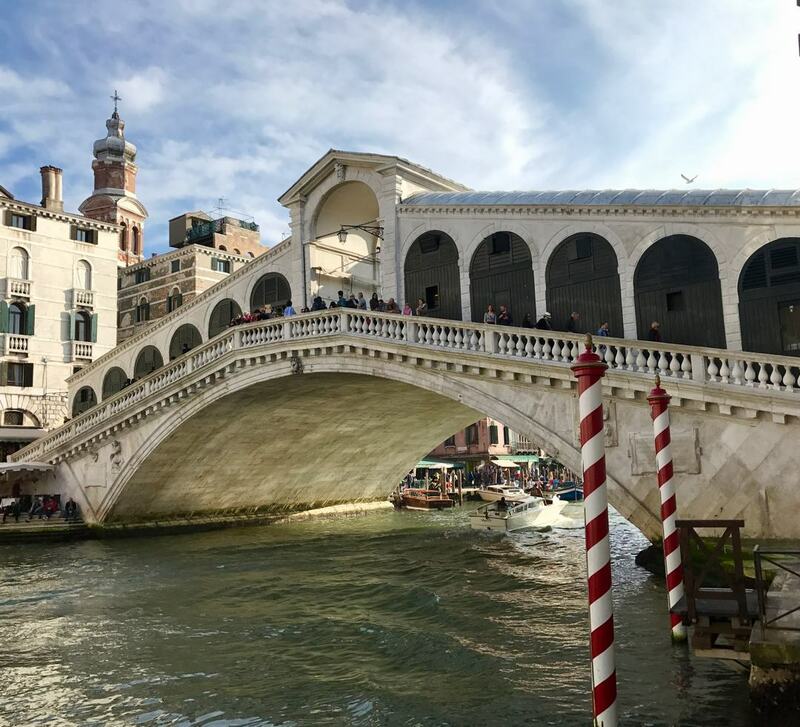 We had ticked off three of the major attractions we (and everyone else) had come to see, The Rialto, St Mark’s and the Bridge of Sighs so there was nothing left but to explore the famous Venetian tapas, Cichetti. As usual there had been some research into where to find the best of these tasty little morsels, but there was no way we were going to find our way to anywhere, in fact getting home looked a distant prospect for a couple of easily distracted and now enchanted travellers. How could we resist poking our noses down every little canal, even if it meant being more, well….. lost? After taking our snaps of the Bridge of Sighs: altogether now: aaaaah, we exited stage left down a tiny alleyway, took a couple of turns and popped out into a square full of bars, which also appeared to be off the tourist route, no English spoken here! We could give you the names but that would spoil the fun of you being lost and finding your own little cichetti haven in Venice, wouldn’t it? Naturally there was sampling of both wine and food, in an array of bars before lo and behold, it happened again. Just as it had in Istanbul, Dubrovnik, Budapest and Rome, we found ourselves perched at the bar in of all things, an Irish Pub. We had, by nightfall, exhausted both our budget and feet, so we set off for “home” or so we thought. It wasn’t long before we decided it might, perhaps, be prudent to check a map. Oh yes, we had done it again, 3 kilometres walked in precisely the opposite direction of our apartment. The absolute beauty of this little mistake was finding that the streets of Venice were pretty much empty, where had all the tourists gone? 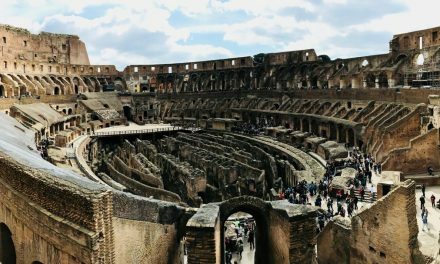 It appears that many tour groups only stay for a day trip, especially during the cooler months, meaning that we could almost share the city with just Venetians, a pleasure indeed. Eventually we found our way home, for a big bowl of pasta and a cheeky little pinot to recover from the unexpected 15km afternoon stroll around the canals. 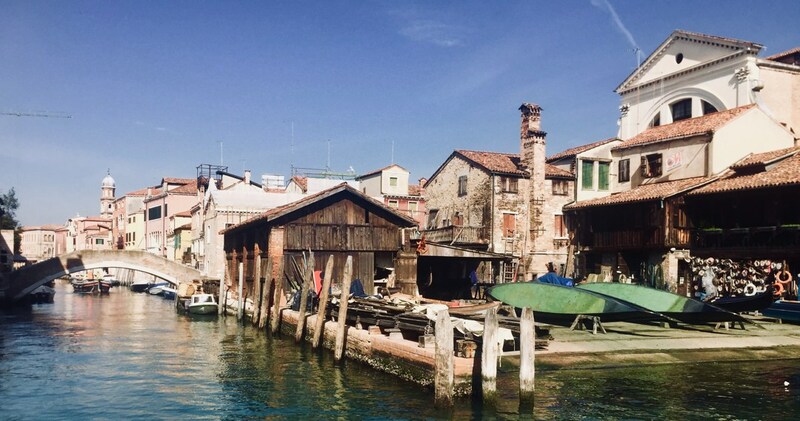 Upon arriving back to the city from Burano, we wanted to take full advantage of our 24 hour Vaporetto tickets so we took the budget travellers version of a Grand Canal tour. Late Friday afternoon was a wonderful time to be jostling with the crowd both in the boat and on the water. Tourists and workers packed into the vessel as water taxis buzzed back and forth, gondolas took their leisurely time to paddle past and a multitude of other vessels cruised about. The canal side view of Venetian architecture is of course spectacular however it is from the water that we found the true power and nobility of Venice and it’s 1500 year history. Not to mention the sheer audacity of building a city in the water; fabulous dreamers those early Venetians. We meandered through the Rialto markets and found our way home slightly quicker than the previous evening. Along the way we encountered groups of young people, chanting and parading in the streets, usually wearing flowers in their hair or around their necks. Naturally we had to know what this was all about. As it turned out our apartment was perfectly positioned between 4 bars where these celebrations were, it seemed at their peak. Given that the party was right down stairs, we spent our Venetian Friday night, not more than half a dozen doors from our accomodation. The celebration was for students completing their degrees and as they were Italian of course it was done in style with roses, martinis, red wine and a delightful jazz trio in one of the tiny, cozy bars. 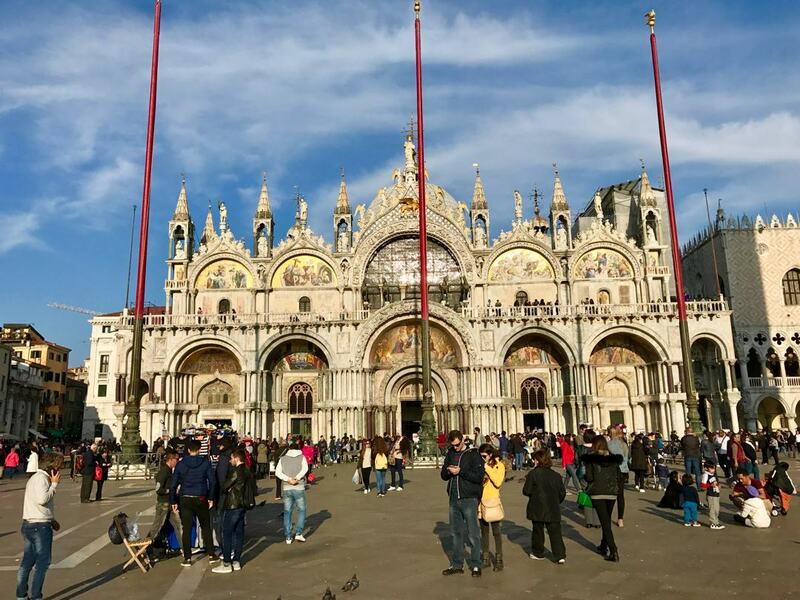 We had decided to have our short break in Venice during the week for two reasons, the train tickets from Tuscany were cheaper and we wanted to avoid weekend crowds. We were lucky to have most of the day to explore more of the city as we had booked a late train back to Tuscany. 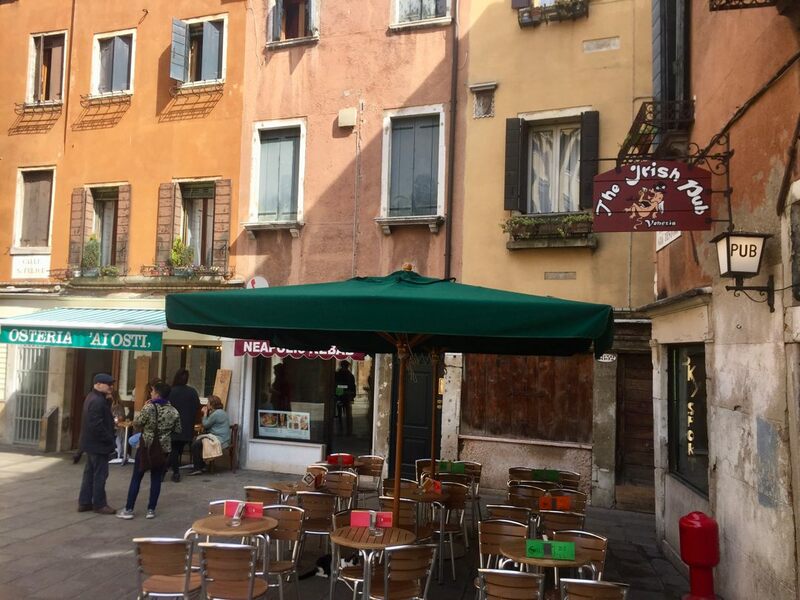 We awoke on Saturday morning to another sunny Venetian day and spent the best part of the morning soaking up the sun with coffee and breakfast. A quick stroll to St Mark’s Square to peruse the shops confirmed that our decision to come during the week had been a good one, the crowds were building and it was not even close to lunchtime. We made a quick exit on the nearest Vaporetto and found ourselves in the Jewish Ghetto area of the city. The Venetian Ghetto is the oldest Jewish Ghetto in the world and the origin of the word we use today. We were drawn into the smaller canals trying to avoid crowded streets and were at once enthralled; if only the walls could tell their stories. It seemed never ending the ability of this city to mesmerise and tantalise at every turn. Eventually our stomachs informed us that a long lunch was due and we settled into a sunny square to enjoy wine, music, lunch and a spot of people watching before catching the train back to our little Tuscan village, Lucignano. Follow all of our travels on your preferred social media channel using the buttons below. We would love it if you shared this post with your family and friends, just click the button on the side. Ok so I’ve been reading a lot about Venice lately! And your post makes me want to go more. Travelling by boat is fun and a city full of waterways instead of roads. Venice is definitely on my bucket list and would love to visit here someday. 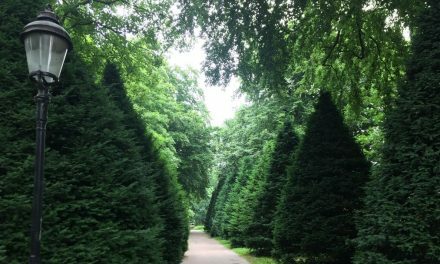 Thanks for this blog! 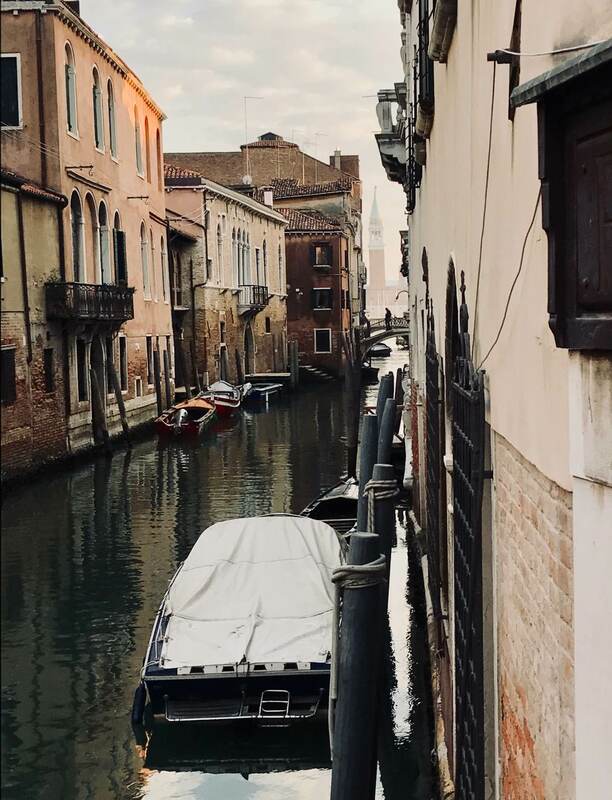 Your post takes me back to the beautiful Venice! I loved it there and you got some great shots! I also did Burano amd Murano…a must to add in for sure! Love your writing style and great to read! Venice is truly one magical city that is the epitome for the romantics and for those who love to soak in an absolute magical atmosphere. Nice reading your post here. Venice looks amazing! I love the idea of just getting lost in the city.